Citing the lengthy federal hiring process, the Obama administration will initially rely on contractors to boost its system for conducting background checks of potential gun buyers as required by the president’s recent executive actions. As spelled out in that new policy, the FBI plans to hire 230 new analysts and other staff to bolster its workforce at the National Instant Criminal Background Check System (or NICS) this year. The Justice Department will first hire contractors to fill its vacancies, Attorney General Loretta Lynch told a Senate committee on Wednesday. “Because we need to move as quickly as possible, we will likely hire on a contractor basis first because that is quicker,” Lynch said. 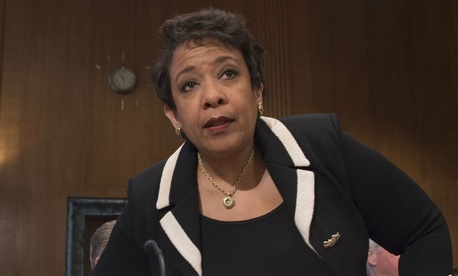 She pointed her finger at federal hiring procedures as necessitating temporary contractors: “As you know, for government employees there is a significant -- I shouldn’t say significant -- but there is time required for background checks and the like.” Lynch added it will take “several months” to get the “full component” of new FBI employees on board. While Republicans on the Senate Appropriations Committee’s panel on Commerce, Justice and Science used the hearing largely to deplore Obama for working around Congress and impeding on individuals’ Second Amendment rights, at least one saw the new hiring as welcome news. The attorney general said the FBI will ask for a $35 million funding boost in its fiscal 2017 budget request, which will go to supporting the hiring spree and keeping NICS’ services available 24 hours per day, seven days per week. Currently, NICS operates only 17 hours per day. Obama also called on the Bureau of Alcohol, Tobacco, Firearms and Explosives to hire 200 new agents and investigators. Lynch said those employees would process the added paperwork stemming from the expanded background checks, focus on violent crimes “plaguing our cities,” and work with state and local officials. Sen. Dianne Feinstein, D-Calif., indicated that the hiring surge may not be sufficient. More than 500 ATF agents are eligible to retire in 2016, she said, potentially creating a vacuum at the agency. She explained the staffing request, which, unlike the FBI, will not commence until it is funded in fiscal 2017, would not increase the size of ATF. Instead, the new agents would “fill the existing slots that are vacant or will soon be vacant.” The attorney general also said ATF’s National Ballistic Information Network will open a new facility in Alabama later his year to track stolen firearms. Feinstein promised to do everything she could as an appropriator to ensure ATF had enough funding to hire a sufficient number of employees. Sen. John Boozman, R-Ark., said the new requirement for the Social Security Administration to provide more information to NICS was “certainly not clarifying existing law,” but rather creating a new one. Lynch countered that objection by noting federal agencies are already required to submit information to the NICS database, and the forthcoming SSA rule would simply illuminate which information must be included.